We know violence here in Oklahoma City. 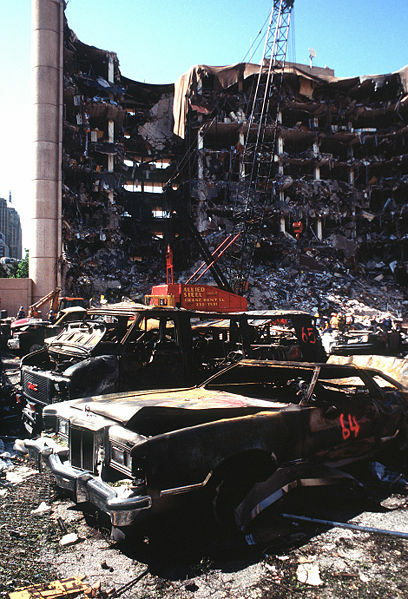 Saturday, April 19, will mark the thirteenth anniversary of the bombing of the Alfred P. Murrah Building. Planners of the recent “Denouncing Violence in the Name of God: The Case of Islam” conference noted the location for the event (Oklahoma City University) and the topic discussed. “The topic of this conference is so profound and sobering because of its time and location. We are in Oklahoma City and it is April,” said Loye Ashton, chairman o religious studies department at the Tougaloo College in Jackson, Mississippi. Various speakers at the conference noted terrorism intends to undermine democracy rather than further a particular religion. Media often makes the connection in such a way readers/listeners come to believe the work of terrorism to be a tool to further a religion, in most cases Islam. The idea a Christian pastor would make a comment, “We find now we have not choice. The time has come ” to destroy “this anti-Christ religion,” inspired by demons who spoke to Allah. Language incites and the very idea of destroying would invariably call for the exterminating of people adhering to Islam. This is incredulous. In fact, the notion we should kill anyone stirs images of the genocide in Darfur. Surely we would not find some reason to believe the hundreds of thousands killed under the eye of the world community could be considered justified for any reason. How could we support the killing of people who hold to another religion? Surely we will not impose Old Testament language to supersede Jesus’ call to love our enemies? On all platforms and occasions I have reiterated that Islam cannot permit or sanction a person to be killed in order to reach any goal. I have always pointed out that the Qur’an regards killing any person without due legal process as equivalent to killing the whole of humanity. Also, I have always reminded others that Abdullah Ibn Abbas, a Companion of the Prophet Muhammad, one of the greatest scholars of early Islam, and the first exegete of the Qur’an, while interpreting the verse related to this, adjudges that one who kills an innocent person will be condemned to Hell eternally. Too many of us jettison the understanding of human beings created in the image of God when we believe ourselves to be the object of hostile enemies. For we who claim to follow the way of Jesus cannot justify our way around Jesus’ call to value people – again, even those who persecute and determined we to be their enemies. I find Natalie’s predicament one of my own. How is it we can continue to war against people when the Apostle Paul specifically notes a part of our armor as Christians is the “Gospel of Peace?” When Peter contends that to suffer for doing good, and enduring, is what it looks like to follow in the steps of Jesus. It seems Jesus intended an end to our warring in both the Garden, the Cross and the Empty Tomb. We think we understand Islam by reading a book by one of our preferred authorities. It seems to me we should pick up the book we allege to be authoritative and let it speak to the kind of people we will be – then following in the steps of Jesus we may point confidently to him who is the author and completer of our faith.